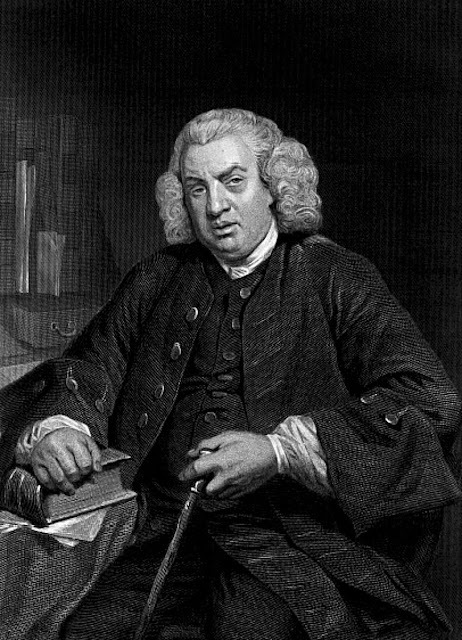 Did you know Samuel Johnson collected orange peelings? * James Boswell's 1791 Life of Samuel Johnson was exacting in its appreciations of Dr Johnson and all his habits. One reported conversation between the two men concerned Johnson's collection of orange peelings. Boswell asked him to explain. "I have a great love for them," Johnson replied. "And pray, Sir, what do you do with them? You scrape them, it seems, very neatly, and what next?" "I let them dry, Sir." "And what next?" "Nay, Sir, you shall know their fate no further." * Johnson opposed slavery and loved his cats, Hodge and Lily. * A report in the British Medical Journal in 1979 was among the first to speculate that Johnson might have had Tourette's Syndrome. It wrote: "Dr Samuel Johnson was noted by his friends to have almost constant tics and gesticulations .... He also made noises and whistling sounds; he made repeated sounds and words and irregular or blowing respiratory noises ..."